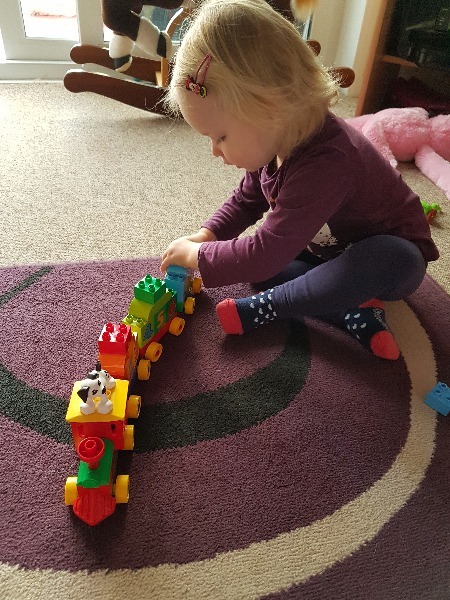 This is the feedback thread for those of you who are testing the LEGO® DUPLO® Number Train set for us as part of our latest MadeForMums product test. 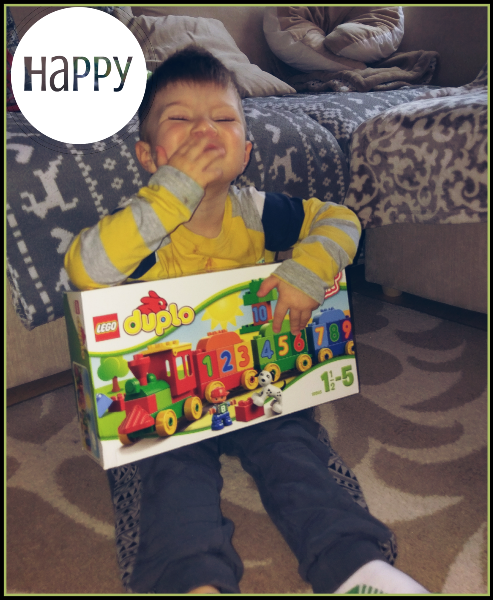 You should all have received your LEGO® DUPLO® Number Train set by now, and have had a chance to test it out – and take a picture of your child playing with it. 1. 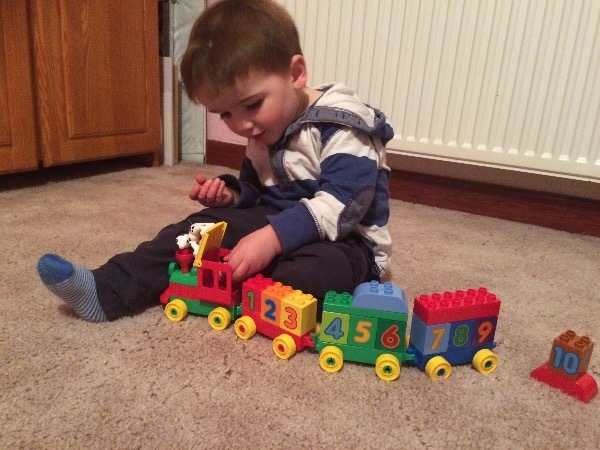 How did your child get on with building the LEGO® DUPLO® Number Train? When you answer, please tell us how old your child is. 3. What do you and your child like most about this LEGO® DUPLO® set? 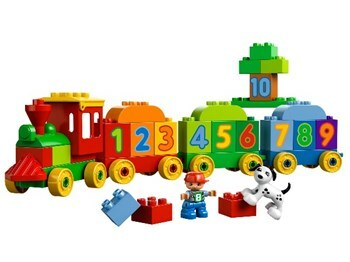 The LEGO® DUPLO® Number Train (pictured above) £12.99, has 31 pieces including 10 numbered bricks and 4 wagon bases, a figure and dog. It can be rebuilt into a tunnel, building, dog house and more. 1. My daughter is 18 months she loved putting the number blocks on the bases and then pulling them back off again good size blocks and she found it easy to put the blocks together and pull them apart. Some of the smaler blocks and and front of the train she needed help with putting together. 2. Yes she liked playing with the train her favourite part w putting the little train driver in and out the front of the train and then shutting the roof she also loved the dog and putting him on the lego bricks. She Dident Really push it along as Is kept falling apart but she enjoyed the bricks putting them together then pulling them apart again. 3. the colours and the size of the bricks where perfect for her age. Her best boys where the dog and the little instructor man. 4. Yes however I think that the carriages could stay together when pushed along as they just come apart and I think that it is defiantly a toy for younger children it says up to 5 but I think it would be to young for this age I would suggest ab age range of 1-3. 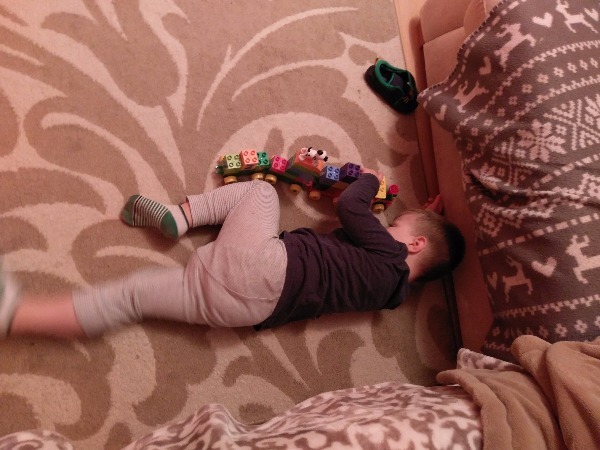 1.My son is 2, he really enjoyed building the train, especially moving the little man and the dog and placing them in different places on the train. I was suprised how good he was at building the train independently, he didn't need much help at all! 2. He was reallly impressed with himself after he finished building the train, he's been pushing the train around the house. He's really attached to the little dog, he carries it around in his pocket. 3.A great first lego set, good introduction to lego for young children. We loved the bright colours and how effective the train looked when he finished building it, and also how easy it was to build and to take apart. 4. I would recommend this duplo lego set to 2 year olds and also to older children. My daughter is 4 and she was helping my son to arrange 'the blocks with numbers on them' in the right order on the train. Good fun! 1 - my boys are aged 1 and 2 it's was nice to see my 2 year old helping his younger brother in building the train set up, Although the box says 1 year plus my 1 year old could not have built this him self. 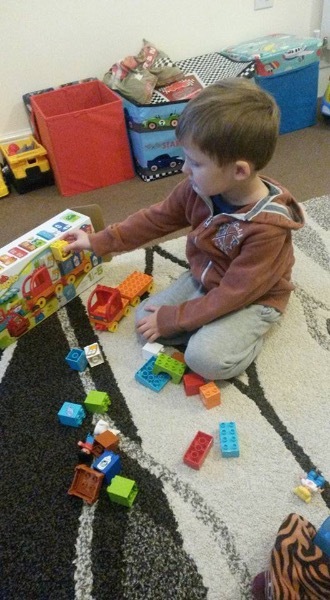 3 - i love the fact the duplo set is nice and Chucky for our little ones hands, and very bright coloured, love the fact it can be used towards early years development teaching little ones numbers. My boys loved the fact they could change the train set to look to how they wanted, showing an open mind to imaginative play. 4 - Yes I would definitely recommend this product to anyone who has a little one, it's fun and can grow with them. 1- My little boy is 20 months old and absolutely loved this as soon as I got the box out shouting choo choo. 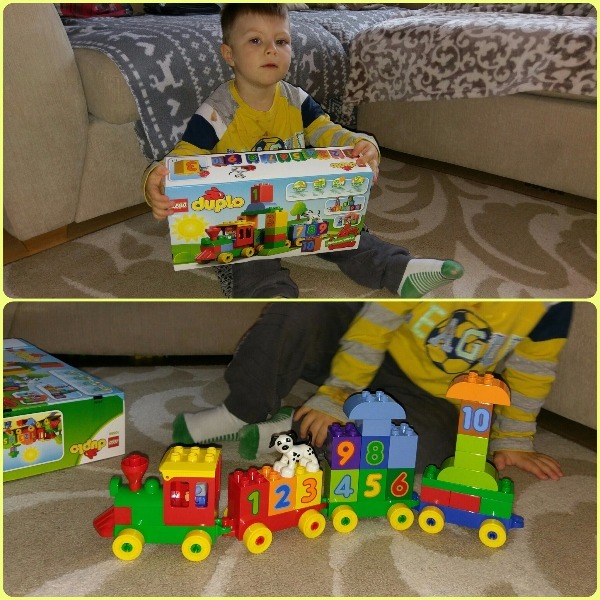 He had a great time building the blocks into towers and then clicking the train and wagons together and wheeling them all over the house. He managed to do most of it himself with minimal help from myself. 2- He had a fabulous time playing with the train and it kept his attention for well over an hour which is very unusual as most toys have a 10 minute attention span at the moment. 3- What I like most about this set is that it's easy for the child to put together themselves also it's brightly coloured and well made. My son loved the little man and the dog and putting them inside the train. 4- I would definitely recommend this to a child of a similar age and older. The only criticism would be that the wagons don't hold together when picked up the connection could do with being a little bit tighter. 1. My sons are 18 months and 3 1/2 years. My three year old managed to build the set with some help from me as he wanted it to look the same as the box. My 18 month old just enjoyed putting the bricks together in his own way. 2. My eldest son really enjoyed it once it was put together as he was role playing with the people and making up stories. Once it was out together my youngest son did enjoy pulling the train along. However he just enjoyed stacking the bricks into a tower the best. 4. I would definitely recommend to people with children of 18 months + as a great introduction to Lego however I think older children might get bored of it quickly. 1. My daughter is 2years old. She loved building and dismantling the train. Although she did prefer to build mini towers on each trailer rather than place them side by side. 2. I helped her build the train correctly and she enjoyed pushing it around and putting the dog and train driver on various parts of the train. 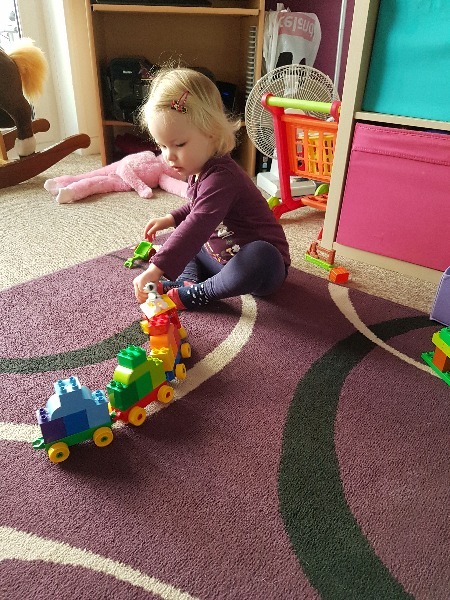 She is able to count verbally to 10 and is able to recognise colours so teaching her visual numbers will be easier with the use of this train. I think her favourite part was the dog and the lift up roof. I really liked that these bricks stayed together unlike others i have tried that feel loose and flimsy. I also like the learning aspect of this toy, colours, numbers, hand eye coordination, construction skills and imaginative play. I would definitely recommend this to others with children of a similar age. 1. 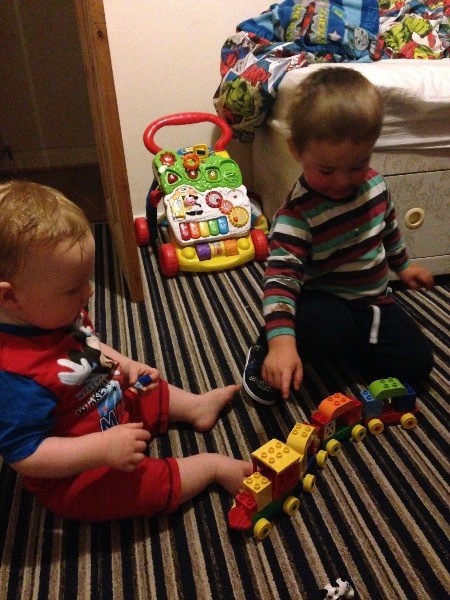 How did your child get on with building the LEGO® DUPLO® Number Train? My little boy Dylan, 2 years 10 months old, had no trouble building the LEGO DUPLO train set. The pieces are great size for his little hands. The set came in a easy to open little bags, that are inside, a very clearly advertising "what's inside" box. It's a great thing, as I always spend hours reading through all toys and boxes to have an idea what exactly comes with it. 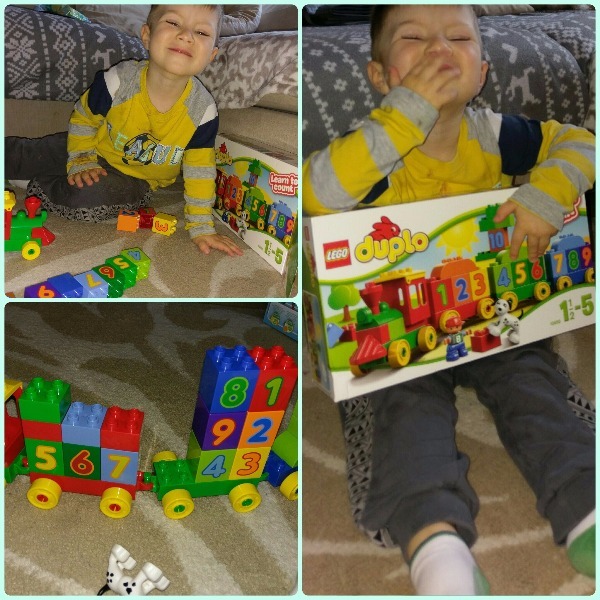 Also it gave my boy a lot of giggles and happy scream for That Specific Number Train, that was in the pictures of the box, so his first question when the set arrived was : "Please Mummy, can I play with the LEGO train? I want to play numbers!" I tried to help him build it to be exactly as the picture, but he clearly had his own idea. His first attempt was not that bad (1,2,3...then 5,6,7/it's on the pic:) ). 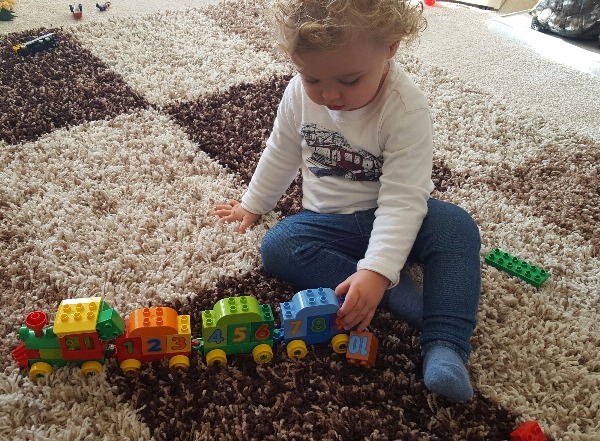 The numbers on LEGO DUPLO are big,different colours and following the standard colour pallete and I am sure Dylan also can see it as he always puts the colours same way on. It must make it easier for the children to remember and learn the right queue. I must add, Lego Duplo is much easier to take apart than the Original Lego, so Dylan constantly has plenty of fun re-mastering his skills. Yes, most definately. The train wagons don't come apart during play, only if you lift it at some angle, yet we found a very little need for doing that :-) so this way it doesn't frustrate my son, he builds it one way and it stays this way for him to play along until he changes his mind to take it apart just to build it up again. Endless fun. The set comes with a little Lego Duplo person; the train driver at the moment:) ; and a little cute dog, which also pushes Dylan's imagination for the play. I love when he is telling me stories about this little dog that hops on the train or when he counts with me the wagons, the number blocks and all the pieces, while he can only count to 20...it pushed him to learn more already, such as counting fingers and toes and then he point to his train and asking to help him count the rest of his building blocks. Amazing!! Personaly, I like that Lego Duplo is solid as well as a great bigger size while not sharp edged set. When Dylan had a tantrum, he threw the train on the floor, on the wall... And none of pieces broke at all(it came apart but that is normal) ! I was glad he could not hurt himself in any way, like poke his eye out, stick anything in his ears or choke by trying to taste it So, dear Moms, it is very safe and fun. As for Dylan, I think the best thing is that it was a gift he thanks for . All he's been doing while playing with it is fun and learning. He said "he loves his choo choo train, he likes the number train", all sorts of stories about how fast is the train going, and that his daddy is coming back home on this train. 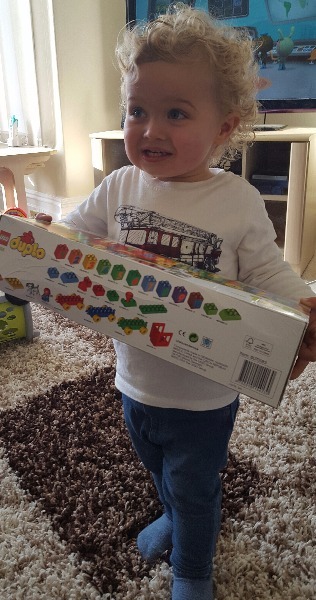 He even hugged the Lego Duplo Number Train a quiet few times, I'm sure he developed some positive feeling towards, fantastic!! Seing him so happy and smart with it makes my day. Yes, we strongly do recommend this product. It's fantastic fun playing alone or together. There are endless ideas for things to build. It inspire young minds imagination. You can build up a bigger collection. It's solid, will last a long time, that makes it worth the money. 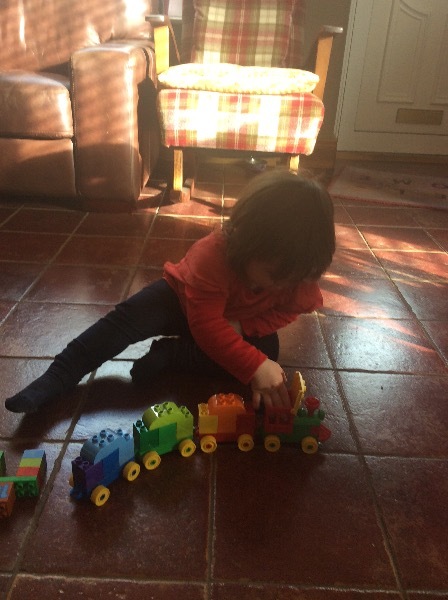 Sophie is 18 months old and I was slightly sceptical about how well she would do with building the train. 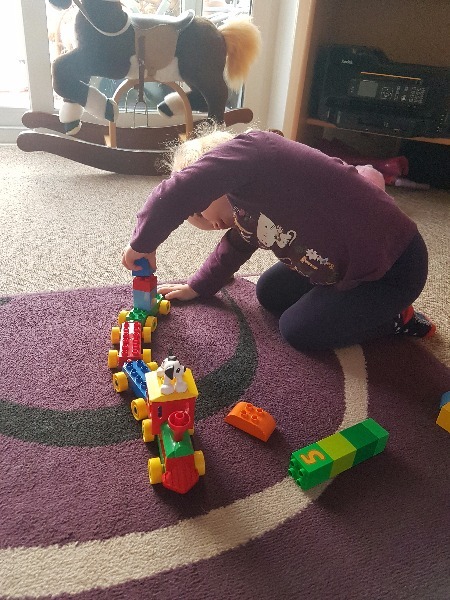 I was amazed at how well she actually did, she wouldn't have done it without help, but we had great fun playing together and putting different combinations of the train together. When we got the number train through I was delighted it was the number train as Sophie has a train she pulls along already and so this was perfect for her to instantly know what it should be like. We also have other Lego Duplo sets which will work very well with the train set but even without those this is great as a stand alone piece. 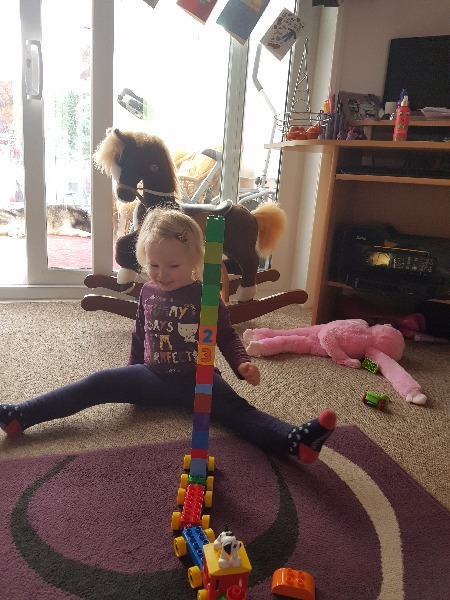 If this was the first piece of Duplo we had, it would get me to go out and purchase more Lego Duplo as it will be something that she can play with at lots of different ages and get something different at each age group. She's a bit too early for the numbers, but she completely understood the way the bricks worked together. This set will earn its keep as she learns different things such as numbers in the future. In terms of the finished set, Sophie loved the dog and the man. Her favourite part was putting the dog into the train drivers cab and pulling apart the bricks. She found the train itself easy to pull around and play with, probably as we were playing on tiles. The dog was the biggest hit out of the whole set and the dog kept getting kisses all throughout the day with her not wanting to put him down. 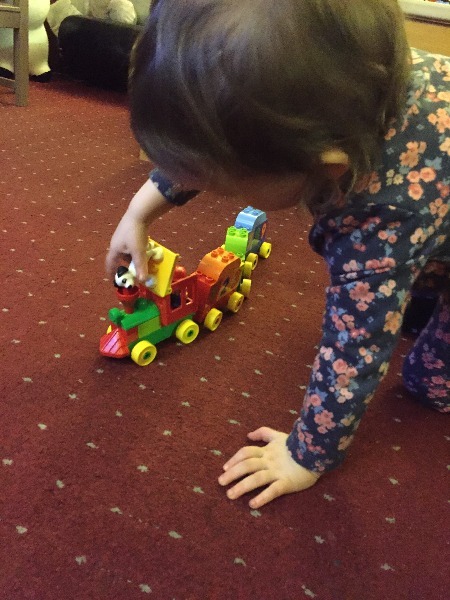 For me as Sophie's mum, I was truly surprised at just how much she is able to play with the number train at only 18 months old. I like the fact that this is a toy that will keep giving in a number of ways. 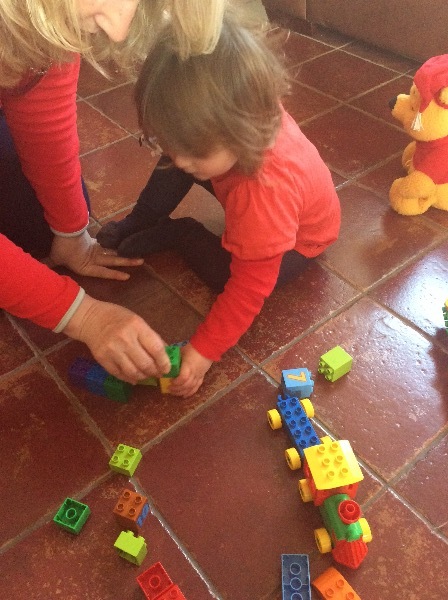 Firstly that even if we lost pieces from it, we can add and change other pieces of Duplo into it (Now I understand seeing parents with great big boxes of Duplo as it doesn't matter if you have a boy or girl) and secondly that as she grows she will get different aspects of play and learning through the set. It will help with left and right brain development, right brain creativity and left brain for numbers and spatial awareness. 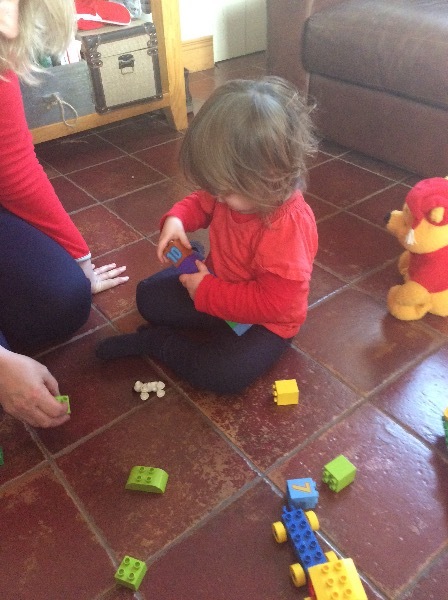 In terms of Sophie, she loved the dog and dismantling the blocks and putting them back together. 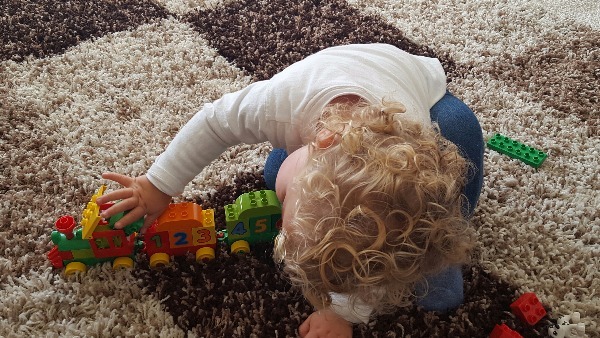 I would definitely recommend this toy to mums who have young children at 18 months old. It's pretty much bomb proof being thrown around on the tiles and although I'm sure it's not really designed for the bath it can double up going in the bath when your child simply won't let the dog go! 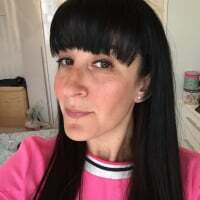 Plus it would be easy to disinfect if your child was playing with it when they had a cold or I'll, or other friends played with it who turned out to be ill etc. Another plus is that having put the set away I let Sophie have it whilst cooking the dinner, she was happy putting bits together having learnt how to do it earlier in the day and I got dinner prepared with a very happy and amused child. Perfect to play together, perfect for learning spatial awareness and numbers but perfect for creativity. You'll be amazed at just how good your child is with it! She really enjoyed the unboxing and couldn't wait to get everything out! We had to help her build it all up as she is only 21 months old, but she did help with instruction on where to put each brick, which she enjoyed. She first thought it was a set of cars as the wheel bases were the first things she saw, but she really enjoyed clicking them all together to form the train once we had built it all. It has traveled all over our home as she wanted to take it into every room! She loved that there was something to wheel around and enjoyed clicking the carriages together. She also really liked the dog as she adores animals! I think I would, as I can see the potential for them to enjoy it for quite some time, particularly if they have other sets so that they can 'carry' different things on the train. We really enjoyed playing with this and I'm surprised bu just how excite my little one was to receive it. My little boy is 2years 10months old. 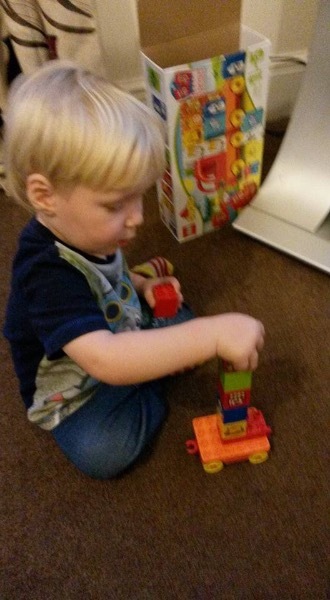 When the LEGO Train arrived he was over the moon and couldnt wait to get started. He enjoyed trying to build it himself and wanted to copy off the box. He did very well and with a few small changes we got it exact. He needed some help getting the numbers in the correct order but overall did well. He loved playing with the finished set and has played with nothing else for the last few days. He has enjoyed taking it a part and re building it several times. He has incorporated playing with it amongst his other train sets and really does love it. Its deinitley the most played toy that he has had recently. 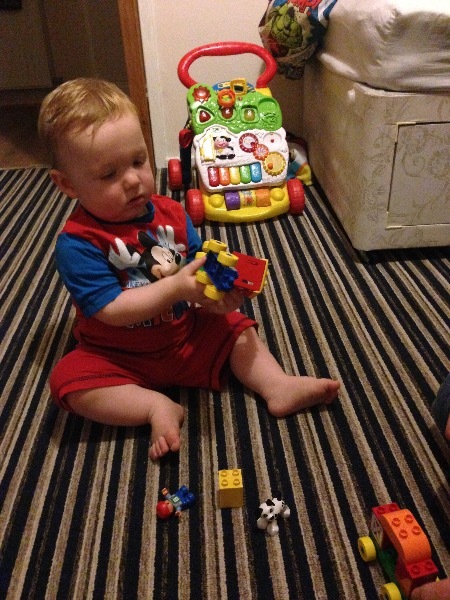 I love that lego duplo is so strong, we have several sets and they are definitley worth the money. My little boy loved the animal and train driver that came with it and he loved that he could take it a part and re arramng the blocks etc. A week later and its still the first toy he looks for every morning. I would definitley recommend this product, i think it is a fab product have loved seeing how much he has enjoyed playing with it. It has definitley encouraged his imaginative play too. Thanks everyone for posting your feedback – and your wonderful pics! 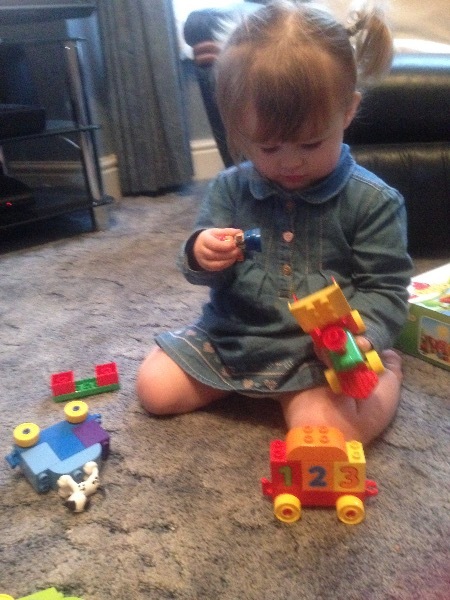 It's so lovely to see your children enjoying their LEGO DUPLO builds.